Zeelander Yachts, a leading Dutch shipyard that creates high-end motor yachts with an elegant New York commuter styled profile, is happy to inform that the construction of the completely new model, the 22-meter Z72 (re-branded from the Z66), enters advanced stages and according to the building plan. The company has begun the hull painting of the very first unit. 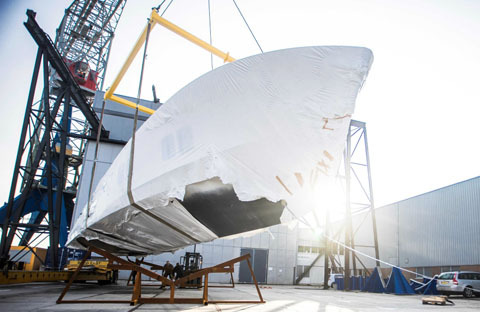 This yacht is going to become the shipyard’s flagship upon the launch in 2019. Zeelander Yachts will reveal full details of the Z72 at the Fort Lauderdale International Boat Show 2018 (October 31 – November 4, 2018). Indeed, the Z72 is going to be much bigger than the current flagship, the Z55, as it blends stylish appearance with some truly unique superyacht features. The new model’s length surpasses 22 meters with a large swimming platform open, while the maximum beam is 6 meters. There will be plenty of deck space and she hits the home-run on Zeelander owners’ priorities – a comfortable, luxurious and family-friendly boat that complies with the latest standards. As her smaller sisters, she will have a sophisticated décor, huge panoramic windows and vast social zones for the best possible guest experience on board. The shipyard’s creations epitomise style and power. The Z72 will carry the same sporty DNA of the brand. Her top speed will exceed 40 knots. Apart from releasing a design concept of the new flagship, Zeelander Yachts will have a new Z55 on display at the Fort Lauderdale International Boat Show 2018 for a world premiere (berth - Green Zone HOF FD 37A). This yacht, just launched few weeks ago, is equipped with a revolutionary engine combination. Two of the most powerful engines in the Volvo Penta IPS range, the IPS1350, generate 2.000 hp and make her the fastest Zeelander yacht ever. She is capable of achieving 42+ knots. In addition, Zeelander Yachts have specifically hired a consulting company to make the new yacht as quiet as possible. After a review, the engineers added additional rubber matting to the chine, and the engine room insulation has been upgraded to a mega yacht level. All pumps and motors are mounted double flexible, which is far beyond the level seen on this size of vessels. A gyrostabilizer is mounted semi-flexible to avoid structural transmitted noises. Special attention was paid to the balance of the engine. Sea trials proved the successful implementations of the above-mentioned solutions.